I’m always a planner when it comes to school, work, my daily activities, my own health and even with relationships. I have a conservative approach in life and always prepare for the worst. I believe that I don’t have the power to control events, other people’s actions or reactions, and the opportunities or chances that come my way. But one thing is for sure – I am capable of controlling my own self and the choices I make. I highly recommend everyone to read this – students, office people, moms, dads, everyone! My first career as some of you might already know is Accountancy. We studied the art of balancing for years! Am I good at it? On a serious note though, life needs a balance of everything. You need to spend time for a little bit of work (for some, maybe a lot 😛 ), for your hobbies, for your loved ones, and for yourself. You also need to balance your money. Simply put, you need to know how to balance what you ‘re earning and what you ‘re spending and of course, what you ‘re saving. And I know that ‘s not a simple task. I think the biggest challenge anyone of my age has to face nowadays is the transition from being Daddy or Mommy ‘s little girl (or boy) to an independent woman (or man) and totally learning to live by your own means. By the time we hit our 20s, it is imperative for us to learn the ropes on how to survive and manage our lives not just emotionally, mentally or psychologically but all the more, financially. All the credits go to my mom. My mom is pretty 🙂 but sorry guys she is already taken! I studied college without any worries because my mom got me an educational plan when I was born. I have been freelancing for two years now but she keeps on reminding me to pay for my SSS, Philhealth, and Pag-ibig to make sure I have some source of fund in case something unexpected happens. She also opened a bank account so that I can put aside a part of my allowance for my needs. I learned to prepare for the future from my mom. She taught me the value of saving up for my needs at an early age – whether it be in a bank account, an educational plan, an investment account or an insurance plan. I know most people shy away from the word “insurance” right at the minute they hear it but I believe that insurance is a necessary expense. Life insurance, in particular, secures your loved ones future in case something bad happens to you. Imagine, if you were the breadwinner of your family and an unexpected event happens. That will not only take a toll on the bereaved ‘s emotional and psychological health. It will definitely take a toll on their finances as well. A lot of families have to lower their standards of living just so they can make the ends meet. But don ‘t think that insurance is only about death. In fact, there are a number of insurance plans you can purchase as a savings or an investment plan which can give you cash benefits while you ‘re still living. In fact, there is even a potential to gain higher returns with these than your typical bank savings account. You can read more about the Three Most Often Ignored Necessary Expenses at my friend Fitz’s blog (i.e. Emergency Fund, Insurance, Retirement Plan). I learned all about these from my mom, but my mom learned the hard way. When I was 2 years old, tragedy struck – my dad was diagnosed with cancer and needless to say, we weren’t expecting it. Nor did we prepare for it. We were able to financially support the treatments and medications he needed then but it would have definitely helped if we had other liquid sources of funds that time. Today, there are health and critical illness plans offered by insurance companies that cover for hospitalization expenses and pays out a lump sum upon diagnosis of a critical illness, such as cancer, heart disease and many others. Take Connie Dizon, for example, a cancer survivor and a Philam Life policyholder. She had everything going her way. She ran a successful business; she takes care of her mother; she was generally happy with her life – until the day she found she had Breast Cancer. 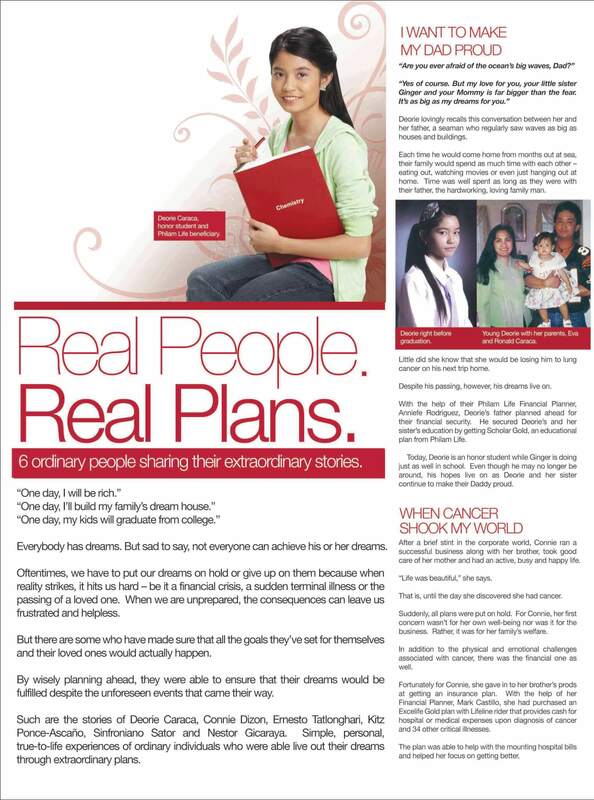 Buti na lang, she bought a plan from Philam Life that helped her with her hospitalization expenses. Today, she is in remission and is back to running their family business. Like Connie, you can easily prepare and save up for these unexpected events with the right advice and the right plan from the right company. The cheapest health plan you can actually get is Philam Life ‘s Cancer Life Shield. This plan pays out a lump sum amount, say P1M, upon diagnosis of the illness. This money can definitely help you be on your road to immediate recovery. Connie is just one of the many fortunate people who benefited from planning ahead. Real people with real plans €“ stories of those who had the foresight to plan ahead for their and their family ‘s future. You can read more about them in the links below. I hope you are all enlightened in someway on the value of planning ahead and would soon start your journey towards Financial Freedom. You can take small steps at a time but once you get the hang of it, you can venture to get more out of your money! Remember, you can make your money work for you instead of you working for your money. So here are a few guidelines on how to start planning for your future. Most are based on my experience, but don’t forget to share your own tips on the comments below! This is your life and your future we are talking about. Be curious. Why are other people successful in managing their money? What is their secret? Be aware that you too can learn how to manage your finances and make your money grow. Know. Know how to do this, read about financial literacy and learn about money. Fitz Villafuerte’s Blog “Ready to be Rich” – a good friend of mine to whom I often ask for financial and career advice. BabyPips – Kindergarten approach on learning all about Forex, if you’re interested. I know most online entrepreneurs are affected of forex so in case you need to understand more, it’s the website to read. 2. Make your pet pig fat! If you lose your job, how long will you live with the money you saved? If I get sick, how will I pay for my hospital bills? Do I have a health card? If not, is my money enough? If something breaks in my house, do I have money for repair? If my car bugs down, is my money enough for repair? It is very important that my car is safe for driving so having my car in great shape is very important – else I can die! These are scary scenarios but they all happened to me at my young age. Start early – if you are a student now, start saving even just one peso a day! and never touch it – ever. Forget about that money you saved. Budget your money and bring enough money you intend to spend for the day. This is related to saving. Separate wants and needs. The more you focus on only the things you need, the more you can save. When you cannot distinguish between wants versus needs, or if you can’t identify a want as a want, you set yourself up to live in a constant state of craving and disappointment – and you keep on wanting more! 4. Make more baby money! I took up a lot of investment courses, stock trading and many other financial instruments training all in the hopes of making my money grow. Don’t we all want our money to make baby monies? I gave up on time deposit and the interest I get from savings account. Yes, it’s a temporary place to keep my money, but again (back to my point on #1) knowledge and awareness is key – that there are better places to put your money too. Don’t underestimate the power of compounding interest! How about you guys? Anong plano mo? May plano ka na ba? *This post is sponsored by Philam Life. 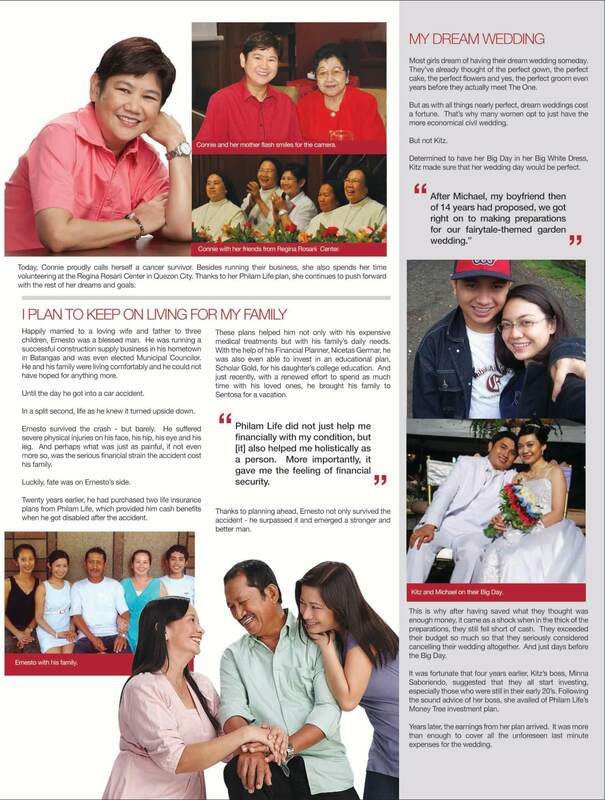 You can also visit www.anongplanomo.com.ph to share your “Sana” (plans in life) or your “Buti na lang” stories (for Philam Life policyholders and beneficiaries) for a chance to win an iPad 2 and more! This is a very good post. I recognize the book. I once attended a seminar about Self-Reliance and notes from that book were used for discussion. slowly but surely is perfectly fine. kanya kanyang discarte.. but the important thing is, you thought about it and you already started it ^_^ yaye! Happy Holidays!